Make the tea by boiling the water and steeping the tea bags for 10 to 15 mins. Add the tea and the rest of the ingredients to a large container with a lid. An ice cream pail works great. 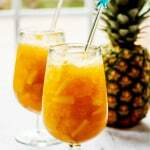 When you are ready to serve, add the slush mixture to a glass. Fill as full as you like and then add soda water to the top, stir and enjoy.